A booklet to accompany a tour of sacred places. Keeping in line with the subject matter of the tour, each booklet was individually hand constructed using materials chosen for their tactile, as well as visual qualities. 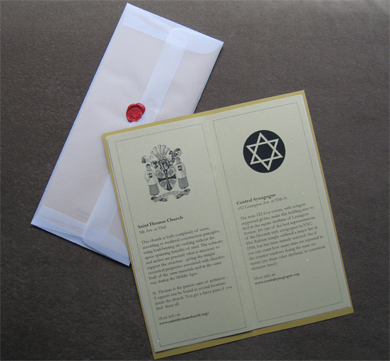 Completed booklets were encased in vellum and sealed with wax.